U.S. 6 (6th Avenue) east drops below grade to pass under Perry Street at Villa Park in Denver. Photo taken 08/11/16. Route 006A - 15.000 miles - the western most independent stretch of U.S. 6 departs Interstate 70 at Exit 11 for the community of Mack. U.S. 6 lines old U.S. 50 east from Mack to Loma, Fruita and the Grand Junction Business Loop (Exit 26). 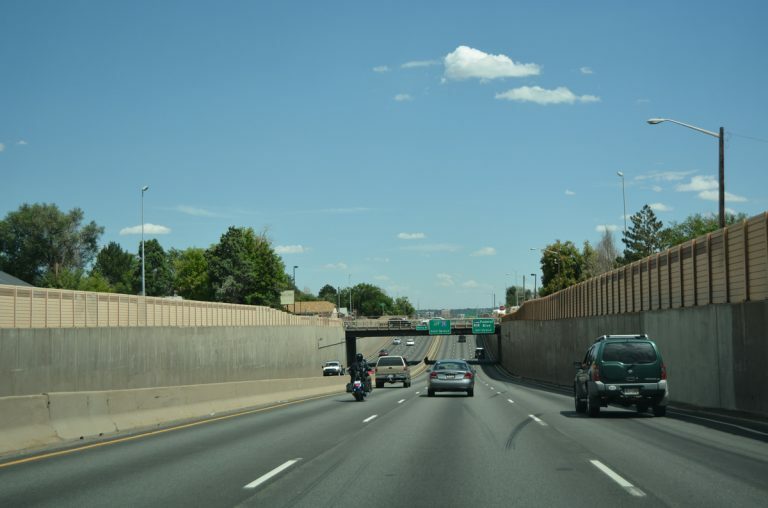 Route 006B - 4.412 miles - While U.S. 6 is cosigned with Business Loop I-70 east from I-70 at Exit 26 to North Avenue in Grand Junction, the second section inventoried by CDOT pertains only to the North Avenue alignment north of the business loop. Route 006C - 8.897 miles - U.S. 6 splits with the Grand Junction business loop at Clifton. The route continues east to Palisade, where it reunites with I-70 at Exit 44. Route 006M - 26.59 miles - U.S. 6 stays on its old alignment from Exit 62 at De Beque parallel to I-70 east through Parachute and Rulison to Exit 87 at west Rifle. Route 006L - 2.345 miles - Segment L continues U.S. 6 east from segment M and I-70 at Exit 87 into the city of Rifle. It ends at the Rifle Bypass of SH 13, which overtakes U.S. 6 east to Downtown Rifle. Route 006D - 18.807 miles - SH 13 separates with U.S. 6 at Railroad Avenue to cross the Colorado River and end at I-70. Segment L represents the continuation of U.S. 6 east from SH 13 in Rifle to Silt, New Castle and Exit 109 of Interstate 70 at Chacra. Route 006K - 0.338 miles - This short section of old U.S. 6-24 in the city of Glenwood Springs is state maintained but not posted as U.S. 6. It connects SH 82 near Exit 116 of I-70 with the north frontage road leading west. Route 006E - 32.723 miles - U.S. 6 emerges from I-70 at Exit 140 in the town of Gypsum. The route parallels the freeway closely to the south through Eagle. The two routes switch places at milepost 154 by Bocoo Mountain and again south of Wolcott. Segment E ends east of Avon at Exit 171 opposite the western terminus of U.S. 24. Route 006F - 21.237 miles - A circuitous alignment with several switchbacks looping south from I-70 at Dillon (Exit 205) to Loveland Pass and I-70 east of the Continental Divide at Exit 209. This section of U.S. 6 offers an alternate route to the Eisenhower Tunnel on I-70 for vehicles that are prohibited from using the tunnel. It also connects to Keystone and Arapahoe Basin ski areas. Route 006G - 27.410 miles - U.S. 6 branches north I-70 to east of Idaho Springs at Exit 244. The winding course of section G parallels Clear Creek east. Lowering through Clear Creek Canyon, U.S. 6 reaches the Denver of suburb of Golden, where it turns southeast along an expressway to C-470 and I-70. 6th Avenue leads the US highway east as a freeway through Lakewood and west Denver to a hidden overlap with Interstate 25 north. Route 006H - 5.340 miles - Vasquez Boulevard takes U.S. 6 north from Interstate 70 (Exit 275) in Denver through Commerce City, and along side U.S. 85, to Interstate 76 (Exit 9) near Dupont. Route 006I - 3.178 miles - This short segment of U.S. 6 forms a business loop along Central Avenue from Interstate 76 through the town of Wiggins. The alignment is unsigned. Route 006J - 95.594 miles - U.S. 6 angles northeast from I-76 (Exit 75) and Route 0034B outside Brush to Hillrose, Merino and the city of Sterling. The route turns east to cross I-76 again at Exit 125 ahead of a rural stretch to Fleming, Haxtun, Paoli and the Nebraska state line east of Holyoke. The one-way couplet through Downtown Sterling is partially inventoried as Route 006Z (0.604 miles) for U.S. 6 westbound between North and South 3rd Streets. U.S. 6 travels east through Lakewood to Lincoln Park in Denver along the 6th Avenue freeway. 6th Avenue was upgraded to an expressway from Golden to Denver by 1957, and a freeway east from SH 88 (Federal Boulevard) to I-25 (Valley Highway) by 1960. Remaining at-grade intersections were converted to interchanges by 1966.2 Photo taken 08/11/16. Closed to both vehicular and foot traffic, and formally named the Christopher Collyer Memorial Bridge, the Rifle Bridge spans the Colorado River just west of Colorado 13 and south of U.S. 6 in the city of Rifle. The bridge historically tied into Railroad Street, two blocks south of the historic route of U.S. 6 and 24 along 3rd Street. Photos taken 10/18/04. Construction of Interstate 70 to the south of the Colorado River in 1977 coincided with the building of a new bridge carrying an extended Colorado 13 south from U.S. 6. The Collyer Bridge was closed at that time. Photos taken 10/18/04. The Rifle Bridge was built in 1908. The two-span through truss bridge was added to the National Register of Historic Places in 1985. Photos taken 10/18/04. Built in 1935, this through truss bridge used to carry U.S. 6 and 24 over the Colorado River at Dotsero. The old highway 6 alignment connects with I-70 as part of a split diamond interchange (Exit 133). Photos taken 10/18/04. Structural deficiencies and substandard design standards ultimately led to the closure and replacement of the Dotsero Bridge. A $6.2 million project replaced the span with a new bridge built just to the south.1 Photos taken 10/18/04. The CDOT Dotsero "green" bridge replacement ran between September 2012 and September 2013. The project was paid for through the 2009 formed Colorado Bridge Enterprise (CBE) Fund.1 Photos taken 10/18/04. I-70 Bridge Replacement in Dotsero. Colorado Department of Transportation project web page.